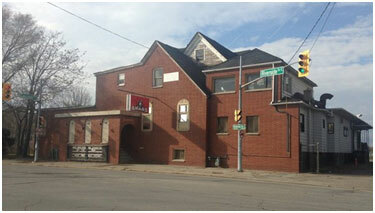 Abars -alternatively known as the Island View Tavern or Island View Hotel – was a hotel located in Windsor, Ontario. Registered by Henri Hebert in 1893, Abars was built in 1904. The building’s name originates from the French pronunciation of Hebert’s name. During the prohibition era, Abars was known for its role in rum-running activities in Windsor. Its location on Windsor’s waterfront and directly across from Belle Isle facilitated the rum-running trade during the prohibition era. The establishment was wired with the Tecumseh Tavern, the Golden House, the Rendezvous, and the Edgewater Thomas Inn; this allowed the bars to communicate with one another in the event of a raid by police. Abars also served as a stagecoach stop, a restaurant, and a hotel. Following prohibition, Abars became known for its fine cuisine and high-class atmosphere. Formal dress was required. In fact, Mrs. Hebert, Henri Hebert’s wife, often greeted her guests at the entrance to the building, dressed in jewelry and fine clothing. As a well-liked establishment, Abars was host to numerous celebrities, including Babe Ruth, the New York Yankees, the Ford Family, the Detroit Tigers, the Fishers, the Dodges, Jack Dempsey, and Al Capone. Since 2002, Abars was owned by Manuel Maroun. In 2010, Abars was included in the Windsor Municipal Heritage Register. The building was closed in November of 2015 as a result of a dispute between the owners and the tenants. To the dismay of many local residents, Abars was demolished on July 25, 2016. Battagello, D. (2015, Nov 14). Historic riverfront bar Abars in decay; operators unable to persuade owner Moroun to make overdue repairs. The Windsor Star. Battagello, D. (2016, Jun 02). Last stand for Abars; riverside duo launch online effort to save old roadhouse as heritage site. The Windsor Star. CBC News. (2016). Abars fans visit building before it’s torn down: Bar hosted celebrities, gangsters during Prohibition. Dodge, Amy. (2016). Abars in Windsor might not be demolished after all. Gervais, C. H. (2009). The Rumrunners: A Prohibition Scrapbook. [Emeryville, Ont. ]: Biblioasis. Montgomery, Marc. (2016). Windsor Ontario: Another bit of history gone. Pearson, C. (2016, Jun 08). Council votes to allow demolition of Abars. The Windsor Star.